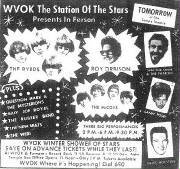 Reviews of the WVOK Shower of Stars Shows obtained from the Birmingham News. No copyright infringement intended. Should copyright be violated, please let me know and I will remove them. For educational purposes only. The Dave Clark Five took over the stage at Municipal Auditorium twice Friday to the delight of the new generation. The quintet was accompanied by a number of the newer recording stars, all delighting the young audience. Some 5,200 attended the performances at 6pm and 9:30pm. Dan Brennan, Johnny Davis, Jim Allen and Joe Rumore, four disc jockeys from Radio Station WVOK, were masters of ceremonies and the lighting effects; still different colors but coordinated to each act added to the dramatic impact of the shows. THE FIRST GROUP was the James Gang followed by the Bill Black Combo. Both were entertaining. Next was one of the big stars. Billy Joe Royal from our neighboring state of Georgia. He was really great, and the kids went wild over the cut Southern boy. Donna Loren, star of Shindig, was billed after Billy Joe and she got an admiring response out of the boys. Since it was before the big game Saturday, one MC called for responses to Auburn, then Alabama, and they were nearly equal. THE BARBARIANS, whose drummer had a hook in place of one hand, all had hair nearly to their shoulders despite the words to their hit song, Are You A Boy Or Are You A Girl? The second audience didn't respond to them as much as was expected after the wild reception given to them by the first one. After them Ronnie Dove, the country and western singer, was introduced. He made his performance complete by singing his newest recording Kiss Away. 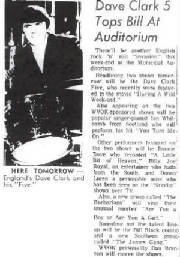 Another of the big stars, Ian Whitcomb, an English boy, appeared right before the Dave Clark Five, who were last. He is a real character and you can even tell it by the clothes he wore. That evening, he was clad in a colorful striped shirt, plaid paints, a checked hat, a fur vest and white boots. He stated that the Southern audiences were much more attentive than the Northern ones and especially these here in Birmingham. Being truly a great pianist, he was appreciated by even the adults in the crowd. He cloned around all through his songs and jumped up on the piano several times. Everyone loved him. THE KIDS all went berserk when the Dave Clark Five came on stage. The lighting was extremely well projected at this time. Focusing lights on them individually at first, then as a group. Somehow the shirts looked luminous. The group really performed extremely well. All are very talented, very intelligent and very good looking young men. They sang ten or eleven songs including Glad All Over, Catch Us If You Can and Shout. Once Dave played his kettle drums, Mike Smith, who plays the organ and does the lead singing, really excited the girls when he rolled his eyes and waved occasionally. Several hysterical females had to be carried away. Dave and his group wore black pants with matching vests, black and white polka dotted ties, boots and no coats. The police were extremely tolerant. When asked, one said he didn't especially enjoy his job but it was a new experience. At intermission, before Ian Whitcomb performed, the MC asked the crowd who they would like to have at the next show. Among those mentioned were the Beatles, the Rolling Stones, the Animals, the Fugitives, Sonny and Cher, and the Byrds. If it is as successful as this last one, and all the other ones have been, it will be well worth waiting for. Yes, Herman of the famous Hermits is really a nice guy. He's easy going, friendly, and intelligent. In an interview before he went on stage for the WVOK show Saturday at Municipal Auditorium, Herman talked about everything from dating to why he didn't particularly care for most of the American boys he had met on his tour. He has good reason. The boys backstage were smartalecs that no one would care for. The show, which featured such stars as the Animals, Lou Christie, and Sam The Sham and The Pharohs, was received by pretty hysterical fans, mostly girls. But the crowd really let loose when Herman appeared. Screams? The audience could barely hear the music over the noise. Herman, who likes to be called Pete rather than Peter (his real name is Peter Noone), said that he wants to be active all of the time. He only likes to sit around and talk when there is some meaning for the conversation. When asked if he wanted to be a singer all the rest of his life, Pete replied, that he wasn't a singer, but an entertainer and that he was happiest when he was entertaining. RUMORS, that the British group, The Animals, is breaking up were verified by B.J. Chandler, a member of the group. He said that they were tired of what they were doing and "the road is really a drag." The mop-haired, rather sleezy looking group which has had such hits as "The House Of The Rising Sun," and "We Gotta Get Out Of This Place" were nice to talk to, but were very liberal with cryptic, meaningless remarks. All of the performers were relaxed, and seemed to like the thought of more publicity. The Hermits, however, were the most affable. Sam The Sham, who considers Birmingham his "performance home," since he got his first break while playing in what is now called the Pussycat A'go go, sports a black beard and a gold earring. The earring, he said, has been there since he was a small child. Birmingham's Hard Times Band, the new group that started off the show, gave a good performance. They now hope to go on to bigger and better things, like record contracts and perhaps a television show. 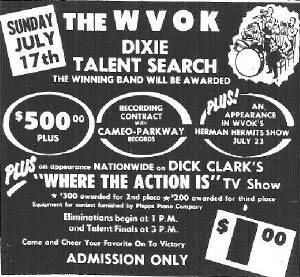 Other performers who appeared were Jerry Lee Lewis, Jeannie Seely, Tommy James and The Shondells, and the McCoys. It was a swinging Saturday afternoon at Municipal Auditorium. For three solid hours the walls shook and shivered with the screams, whistles and loving cries of a pre-teen to college audience, and a surge of rocking, rousing sounds. The occasion was WVOKs Shower of Stars and it was devoted exclusively to the sound of music as presented by the rock and roll society. The Count Five opened the bill with Psychotic Reaction, and it set the tone for the whole evening. The British and Americans shared the honors of the afternoon. Lou Christie, The Happenings, Count Five, and the Beach Boys represented the Colonials; Peter and Gordon, The Hollies and Ian Whitcomb, the Redcoats. A small army of policemen flanked the orchestra pit and the doors to protect the performers from the over enthusiastic onslaughts of their admirers. PETER, OF PETER AND GORDON, remarked casually that they usually wore leather (as he was wearing them) because it resisted tearing more readily, and help together longer in the stage door clutching and pulling that followed a show. Lou Christie literally pulled the kids from their seats with his falsetto songs, extraordinary dancing. The Happenings sang their No. 1 hit, See You In September, and their new record. Peter and Gordon sang and played guitars, displaying real musicianship. The Hollies and Ian Whitcomb received loud applause, wild cheers. But it was the Beach Boys whom everyone had come to hear and they obliged in high style with their repertoire of past and present hits. With this group the sound not the song, is what really counts with their fans. In a way its a pity. Much of the words and music of their original compositions are very good. Their fame, however, rest on their surfing sound. All too soon, for the audience, it was over. The Beach Boys ran from the stage, straight through the open door, and were whisked away to their hotel, leaving long faced fans dejectedly holding their autograph books, and double lines of ticket holders stretching around the Auditorium, awaiting the Next performance. Saturday brought the perfect package of holiday entertainment to young music lovers as WVOK deluged them with a Shower of Stars. Boys and girls from all over Alabama packed the Temple Theatre to scream, shout, applaud and take flash photos as the host of headliners gave their all. THE RUBBER BAND snapped into action and three hours of fantastic, non-stop Hot Hundred music was under way. A VISIT TO one of these performers makes you understand why most pop performers are splinter thin. The gymnastic feats that accompany every song would do justice to an Olympic trainee. Even Billy Joe Royal, who claims to do only straight singing, does a lot of fancy footwork as he belts out his songs. Every type of pop music had its moment, from the straight country style, of David Houston to the rolling rock of ? And The Mysterians. No effort went unrewarded. Every group had its fans, and each received a hail and farewell that would do justice to a kings coronation. SAM THE SHAM sang and danced, turning in his usual fantastic performance, even thought suffering from a Joe Namath knee! The aesthetic Byrds delighted the audience with their music, which they once defined as rambling and rock, but their abrupt departure from the stage caught the audience with its mouth half open and its hands in its lap. The Web (also doubling as The Candymen for Roy Orbison) soloed and backed up other groups in admirable style. The McCoys poured out plenty of hard rock for the teens to shout to. THE NEWBEATS, neat as Ivy Leaguers in trim suits, ties and button down collars, offered tunes tailored to their talents. The show closed with Roy Orbisons very real and genuine talent. He eased onto the stage, adjusted his guitar, and launched into a series of songs that justify his top rating here and abroad. The guy can sing anything and sing it well! His repertoire covers every phase of pop singing from hard country to easy listening. No wonder Nashville couldnt hold him. Its no understatement to say that Roy Orbison belongs to the world..the pop world. The Temple Theatre seats are about the most uncomfortable anywhere, but his audience stuck to them through the last chord and screamed for more! It was a big day for pop rock! 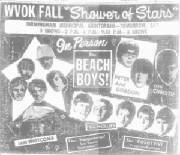 Rain didnt dampen the high spirits of the big crowd of pop music lovers who flocked to Birmingham Municipal Auditorium Saturday for WVOKs Shower of Stars. I never cease to be amazed by the total performance of these musical phenomena, Tepid performances are rare. Almost without exception these singles, duos, and groups throw themselves in to their work and their fans reward them with cheers, whistles and screams and utter devotion. Saturdays celebrities included electronic groups Flash and the Board of Directors, who travel regularly with The Raiders, Tommy James and the Shondells, and The Music Explosion. Popular singles were Tommy Roe, big and browned and so good looking, Neil Diamond and his band and Keith Allison, idol of Where The Action Is. Lou Christie, of course, evoked his usual intense reaction from the crowd with his vocal and physical gymnastics. Costumes varied from neatly conservative to wildly way-out. The Buckinghams, a Chicago quintet, were popular favorites. Frankly I missed the horns and violins that they use in their records, and which they do not carry on tour. However, their performance was excellent and outstanding. BUT NOBODY outdoes Paul Revere and The Raiders on any show. His fans are legion. 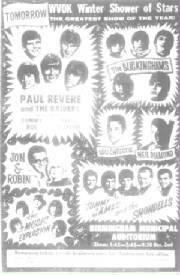 This was evident by the large number of Mark Lindsay for President and I Love Paul Revere and The Raiders buttons pinned to mini dresses, coats, and sweaters. One devoted fan, Paula Rogers of Huntsville, baked a cake shaped like a Raider tricorne. She made the trop down to present it personally to Mark Lindsay, prior to their stage appearance.